For the past few years I have travelled to the South West of France with my colleagues in The Wine Gang. We have been engaged by the region to taste and select wines from the various appellations of the South West, like Madiran, Gaillac and Cahors, with our selection being featured throughout the year at the South West’s Maison des Vins in London. Each time we spend a couple of days immersed in tastings, and then a few days visiting vineyards. The (possibly mythical) land of the mountains is indeed one of France’s hidden gems. Tucked into the foothills of the Pyrenees, the vineyards rise close to 500 metres and lie just a few kilometres from the border with Spain. 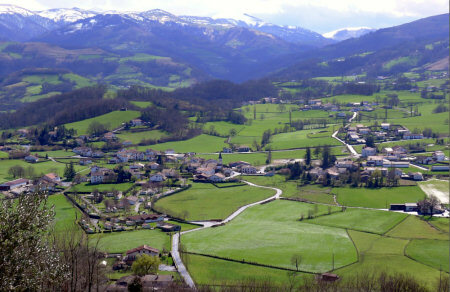 This is deep in Basque Country, where dual language signs proclaim both Irouléguy and Irulegi. It is extremely beautiful, terrifically green and fresh, the mountains framing picture-postcard villages with their steep-roofed, alpine houses. Two hours driving from the small airport at Pau will get you there. This is a land of mixed agriculture, where raising sheep or growing peaches is as prevalent as cultivating vines. Vineyards exploit the lower slopes of the mountains, generally planted at between 200 and 480 metres. The Atlantic is a big influence here, but so too is the shelter of the Pyrenees, meaning rainfall is moderate and sunshine is plentiful. A long, fairly cool growing season is typical. Based on limestone, the soils vary from clay in the valley close to the area’s rivers, to red sandstone, slate and gravel as vineyards climb into the foothills of the mountains. Click image for bigger version. Grape varieties have much in common with the northern Spanish vineyards of Txakoli just across the mountains. In the local dialect, Bordelesa Beltza (Tannat) and Axeria (Cabernet Franc) are most favoured for red wines though so too is Axeria Handia (Cabernet Sauvignon). Today red and rosé wines make up 90% of production, with white wines made from Xuri Zerratia (Petit Courbu), Izkiriota Ttipia (Petit Manseng) and Izkiriota (Gros Manseng). Many vineyards are planted on terraces dug from the hillsides, and freshness is the key for all wine styles in these mountain vineyards. The Tannat-based reds tend to be a little lighter and fresher than those from Madiran to the north for example. In my short time in the region I took in a visit to arguably their most important and pioneering estate, Domaine Brana, then the Cave Cooperative hosted a tasting of several other individual estates and the coop wines. Jean Brana (left) met me at his beautiful ‘tower’ winery. This building is a real landmark, dominating the hillside and framed by the steep, terraced slopes covered in vertigo-inducing vineyards over which huge vultures circled endlessly on my visit. Irouléguy is a tiny appellation, totally dominated by its cave co-operative which accounts for the vast bulk of production from 40 growers. Of the handful of estates producing and bottling their own wines, Domaine Brana is without doubt the leading light, founded by Jean’s great grandfather 1897. When Jean’s father took over the business in 1974 it was still principally concerned with growing pears, plums and other fruits for the production of eaux-de-vie. It was not until 1984 that Jean came on board and the first vineyards were planted. Jean began to plant and buy vineyards having visited Switzerland to see how they build the terraces that support their industry. Initially the fruit was sold to the co-op, but they became the appellations first independent wine estate. “It’s a quirky appellation,” says Jean. “Everyone makes very different wines from their neighbour.” Most grow Tannat, but Brana has focused on Cabernet Franc which was “Born in the Basque country,” according to Jean, who cites a study proving this was its birthplace. “And we liked the taste too,” he adds. It is a small and very carefully managed estate, and an interesting one. Jean tells me he ceased farming biodynamically in 2003 and now practices ‘lutte raisonnée’ whilst taking great care to encourage biodiversity and minimise spraying, “Especially because we keep bees,” he tells me. 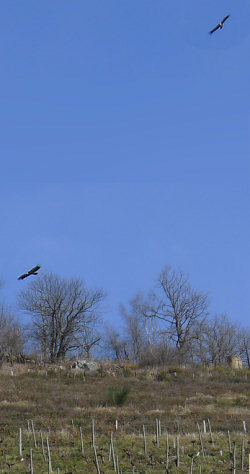 That biodiversity is proved by the every-circling vultures over the vineyards. He has placed bird houses and feeding stations around the vineyards, with a specific programme to reintroduce red-leg partridges into the vineyards to join the vultures, wild boars, deer, hares and woodcock numbered amongst the many creatures sharing this habitat. 13.5% abv. 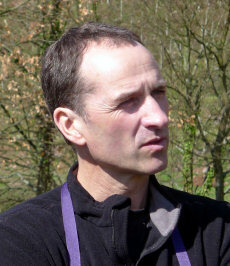 Domaine Brana’s wines are stocked by The Wine Society. This white blend is 50% Gros Manseng, 20% Petit Courbu, 30% Petit Manseng. This is the estate wine (there are also two other cuvées). Aromatic, with passionfruit and elderflower lift, lots of very ripe fruit beneath, some citrus peel. Really fresh and vibrant and an intense palate – a great thwack of grapefruit flavour and acidity, really mouth-watering with a lovely touch of saltiness in the finish. 91/100. Around £17.00, see all stockists on wine-searcher. 13% abv. 50% Tannat, 40% Cabernet Sauvignon, 10% Cabernet Franc. The name means “red stone”. Really nice nose, the vinous, cherry and sweet meaty and earthy edges melding nicely, the whole elegantly black fruit and wisps of smoke. Big, powerful palate, lots of grippy, tight and chewy tannin structure here, a tingling spicy finish, but there is freshness. 89/100. Around £14.00, See all stockists on wine-searcher. 13.5% abv. 60% Cabernet Franc, 20% Cabernet Sauvignon, 20% Tannat. Again a lovely vinous nose, with chocolate and plum depths, but has a sense of smoother, more elegant character and the whole picture has a little more “white space” around it, pepper and spice and an elegant coolness, with medium body and a gentleness to the tannin and acid structure that makes it creamily appealing whilst staying super fresh. 91/100. See all stockists on wine-searcher. 14% abv. Arretxea is imported by Caves de Pyrene and farms biodynamically. This white wine is a blend of 55% Gros Manseng, 42% Petit Manseng and 3% Petit Courbu coming from a mix of soils: slate, clay with rough stones and limestone. This has a golden yellow colour with a fine skin-contact nose, melony, with lime rind and a touch of spice. Delicious mouth-filling palate, with lots of powerful flavour and concentration. Quite long, with substantial fruit sweetness but a dry, savoury core of acidity and definite saline, mineral character. A big, substantial wine but not lacking freshness. 90/100. £27.50, Philglas & Swiggot. See all stockists on wine-searcher. 12% abv. 50% Tannat, 27% Cabernet Franc, 23% Cabernet Sauvignon. Very bold, youthful colour. Very fresh and inviting on the nose, with lots of bright, cherry and rose hip aromatics, a dry charcoal note and refined mineral character. A lovely bracing freshness on the palate here, so much crunchy black fruit, a little layer of cedar and smoke, and a long, spice and pepper-infused finish. Nice touches of liquorice and a roughening plum skin tartness. 90/100. Around £17.00. See all stockists on wine-searcher. 12% abv. 70% Tannat, 30% Cabernet Sauvignon. Lovely smooth and fresh appeal here, the creaminess of the oak and little layer of vanilla, perhaps just a little too much for the fruit. The palate is fairly lean, there is just not quite the flesh and mid-palate concentration for the fruit here, but it is a good wine, with a long and balanced finish. 88/100. Around £25. See all stockists on wine-searcher. 60% Petit Courbu, 40% Petit Manseng. From chalky soils and certified organic, no sulphur added until a little at bottling, this sees 12 hours of skin contact. It has that earthy, wild yeast character, a touch of herbs a touch of medicinal, clove quality, dry and apple-scented. On the palate this has plenty of ripe, quite weighty fruit, a certain oily, herbal quality a touch of fresh cherry is quite Italianate (Italian red that is!) in a textured, powerful wine with bags of flavour. 91/100. £18.95, Yapp. See all stockists on wine-searcher. 12% abv. 70% Tannat, 30% Cabernet Franc. From schist soils. Lighter, cherry and pomegranate colour. Vinous, gently earthy and gently smoky nose. The palate is bone dry and full of texture and flavour, But there is tannin here, grippy and very dry, little glimpses of roses and red liquorice, a powerful. Very much a food wine this, weight and power despite the low alcohol. Fascinating. 89/100.See all stockists on wine-searcher. 13% abv. Fresh, instantly appealing nose, has that Italianate cherry brightness – almost Chianti like. The palate has a dry tannin structure and dry fruit extraction too, with a medium-bodied, but chocolaty smoothness. This is a suave and sophisticated, commercially appealing style, and very nice drinking too. Tannat does force its grippy personality on the finish, but really it is beautifully balanced and fresh. 90-91/100. £16.75, Yapp. See all stockists on wine-searcher. 13.5% abv. Organic, 40% Tannat, 38% Cabernet Franc, 22% Cabernet Sauvignon. 24 months in oak. Lots of oak evident here, but there is the fruit and meaty, earthy concentration behind it, a touch of leather and tobacco, but also of fleeting floral and herb glimpses that add real complexity. The palate has a bloody concentration and smooth, delicious fruit quality. Big, sour cherry and lemon finish with robust but refined tannins. 92-93/100. £24.75, Yapp. See all stockists on wine-searcher. 14% abv. 50% Tannat, 30% Cabernet Franc, 20% Cabernet Sauvignon. Bold cherry/garnet colour. A touch of chocolate and earth here, to quite bold red fruits. Burst with juicy flavour on the palate, plenty of cassis and bold cherry, sour cherry acidity with a touch of lemon squeeze freshness, matching up to the sweetness inherent in the fruit. A big wine, less subtle than the Illaria, but bags of flavour and personality. 88-89/100. No UK importer.See world stockists on wine-searcher. 13.5% abv. 60% Tannat, 40% Cabernet Franc. Rather reductive nose, lots of swirling begins to open it up. A nice cherry aromatic comes through, with a certain creaminess but freshness too. On the palate that edgy, bold fruit concentration, grippy, quite chewy and a touch lean perhaps, but with the right food this more muscular style would come into its own, and it is very well made. Chewy and liquoricy. 89-90/100. 12.5% abv. 80% Tannat, 20% Cabernet Sauvignon. Very deep, dense, and dark colour. A touch rustic on the nose, with some animal and gamy character, obvious concentration and the ripe and rich thickness of the black fruit comes through with meaty power. A mouth-filling ripeness and richness to this, with a bloody undertow and nice sour cherry bite. The sweetness plays against it very nicely, in a meaty, moreish style. I grew to really like this – great length and tangy presence in the finish. 91/100. 13.5% abv. Another producer imported by Caves de Pyrene. 75% Gros Manseng, 25% Petit Manseng. Six months in oak. Quite a deep, golden edge to the colour. Quite an oxidised feel and a vegetal character to this on the nose, honeyed too and intriguing though not so immediately fresh. On the palate a huge core of fruit sweetness, really ripe and powerful, a honeyed character, some real spice and that lingering suggestion of sweetness. 89-90/100. £15.99, The Smiling Grape. See world stockists on wine-searcher. 13% abv. 50% Cabernet Franc, 40% Tannat, 10% Cabernet Sauvignon. 15 months in oak, 40% new. Very dark, rich, chocolate-infused stuff, tight, a touch of medicinal, clove quality, some nice cedary oak and spice. The palate is dry and has lovely depth and concentration. Almost like a meaty, solid Bordeaux of St Estephe perhaps, but a very nice, classic style. 89-90/100. See world stockists on wine-searcher. 13% abv. 65% Tannat, 10% Cabernet Franc, 25% Cabernet Sauvignon. 12 months in oak barrels, 20% new. From a vintage generally regarded as of outstanding quality. A certain creaminess, a cedary finesse, and tobacco touches, there’s a freshness here too. Delicious palate, the fruit concentration is lovely, but always retaining a crisp edge of acidity and very tight, lean tannins. A fine, structured wine with that great balance of medium body and some energy, and weight of concentration. 93/100. Around £15.99, The Smiling Grape.See world stockists on wine-searcher.